您買的紅豆是不是去衣紅豆? 如果我想做綠豆, 那做法是不是一樣啊? 因為人家說會有豆殼, 要隔走, 我好混亂啊..,. 還有, 基絲汀, 您有沒有紅豆沙(最好是綠豆沙)的食譜啊. 別處的食譜寫得很模糊, 很難明白啊. 因為我家的大爺好想食綠豆沙, 可是我不會做啊. my mother-in-law want this but with green bean paste, you know how to make it? Use the peeled green beans which are available at Asian store and cook until softened, add sugar. Just like the way of cooking red beans. I have a bag of tapioca flour at home and I am trying to find ways to use it. Can I use it to make the skin of the glutinous rice ball? Would it turn out ok? Hmmm...tapioca flour and glutinous rice flour are two different things. 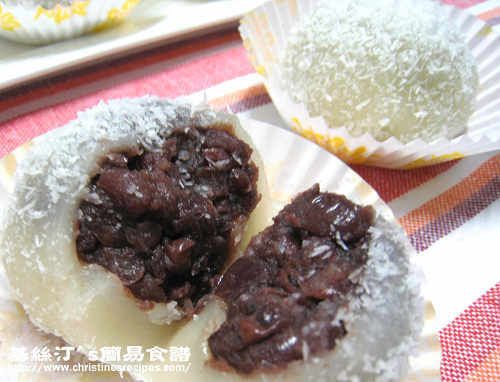 I wonder if you can make glutinous rice balls with tapioca flour. 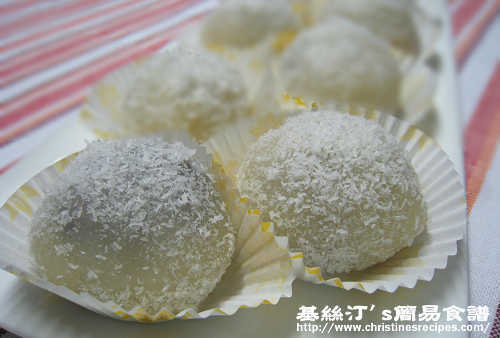 I tried your reciped yesterday but failed, the glutinous rice balls were very hard, what's the problem in between?? If you followed this recipe, I really don't know why you failed. Sorry. I've tried this recipe several times. They were good. 我試過做一次, 但因為粉團太黏, 形狀搓來搓去都唔圓. 有嘜辦法改善? 例如加油/椰絲/糕粉在手套上會唔會好d? 多謝妳的教法, 我已經好成功地試做三次, 也用芒果汁代替椰奶, 效果一樣好, 好軟好好味. I tried, but failed, too. After steaming for half an hour, the skin is too thick no matter how I try rolling it thin. The skin bounce back. I cannot close the ball. The skin does not stick together at the opening. I suspect it can be different glutinous rice flour that can make it. Christine, is it ok to let us know the brand name of the glutinous rice flour? or show us a picture of the glutinous rice flour that you use? Yes, the cooked glutinous skin tends to shrink back. When the flour is still hot, it's easier to spread thin, so I have to work very quickly. 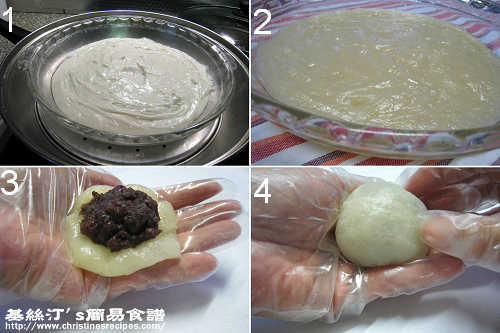 I used Erawan brand, 三象牌 glutinous rice flour. I am really bad at cooking, failed at almost everything I tried. But on the second time I made this following your instructions, I succeed! Thank you so much for sharing! Congrats! Really happy for you. Keep cooking and you'll be more experienced. 參考各位0既留言, 初時都擔心整唔到, 因為我係一個冇乜煮食天份0既人, 但係又比我成功咗!! Happy!! 不過, 我係蒸完啲粉後攞唔到啲粉漿出黎, 我已經係隻碟到渣咗油??!! 所以只好由隻碟到一舊一舊扯出黎包, 一總包咗16粒^^, 一包完自己就食咗5粒!! 唔係誇張, Christine, 你個網站真係令我覺得冇可能都變成有可能!! Thank you soooooooo much! !